You're on the internet, so you must love cats. It's the law. Though, even if you don't love cats with the obsessive fixation of a crazy cat lady, perhaps there's still something for you in Team Meat's upcoming Mew-Genics? I mean, it's Pokemon meets Animal Crossing plus a pinch of Tamagotchi and a dash of The Sims. With cats! 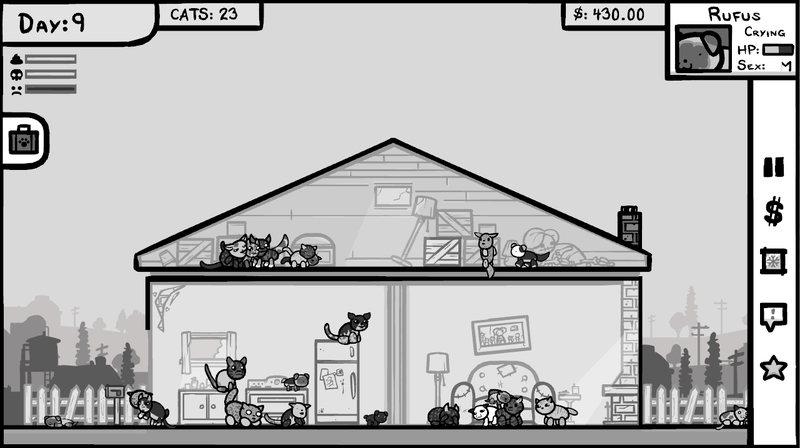 The Super Meat Boy developer Edmund McMillen has been teasing Mew-Genics for weeks now, but it wasn't until this weekend that he finally pulled the curtain back on his latest game. Apparently, it's the most complex game he's ever made. Last week I was playing a game with Puddle, a fat female cat I had been working on earlier that day, I thawed her out of her Cryo-cube and placed her in my current single story house along with her newly generated companion Champ. I had been focusing my time on Puddle due to the fact that she seemed to have a very unique tail that I believe had helped her place 2nd in a cat pageant in a previous and I needed to breed her so I could continue her bloodline before she got too old. Sadly Champ wasn't up to snuff and Puddle made this obvious by repeatedly kicking him in the face, I separated them quickly by putting champ in the attic but when I tried to feed him.. something odd happened. See, Champ was a dullard and when Puddle kicked him he just happened to also be eating and now associated the trauma with food instead of Puddle herself, he was scared of all food.. and sadly died in the attic shortly after. He goes on to describe catching a stray cat, getting his cat pregnant, only to find out the stray cat is a narcoleptic and so his new kitten offspring are, too. The stray cat runs away, the kittens don't win any pageants (too busy sleeping), and the mom cat ends up with feline aids. But there's no treatment, so McMillen cryogenically freezes the cat in the hopes that there's a cure for her disease in the future. And then to cap all THAT off, he's arrested in-game because of his cat care, but it could be the pet running away, the dead cat in the attic, or a bunch of other things. Too many variables to take into consideration, it seems. This story, plus the insane number of randomized elements in The Binding of Isaac make me think that Mew-Genics has a lot of storytelling potential. Even just considering the cats—there are 25418658283290000000000000 possibilities and that number is only growing... and it's not counting "their kitten states, sizes, animation sets, stats, personality, etc." There's no official release date yet, but McMillen says the game is coming to Steam, iOS and Android. We'll keep you updated.